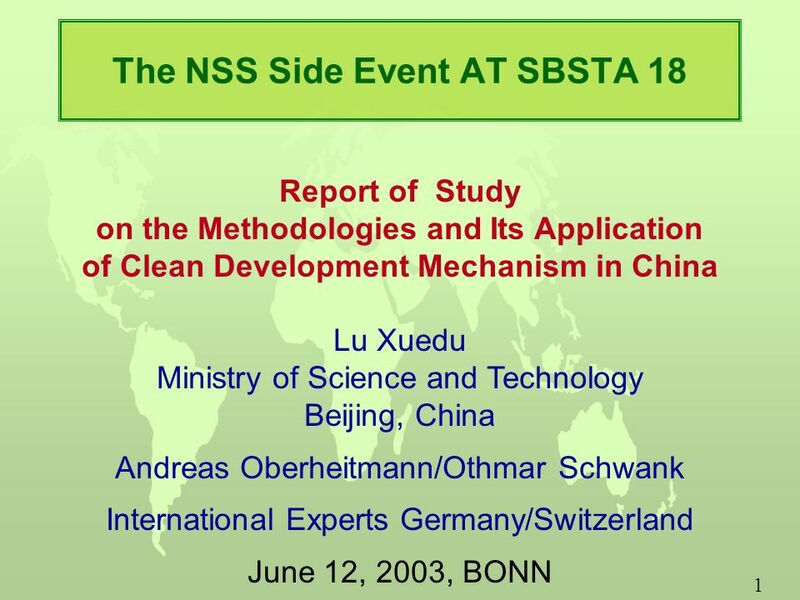 1 The NSS Side Event AT SBSTA 18 Report of Study on the Methodologies and Its Application of Clean Development Mechanism in China Lu Xuedu Ministry of. 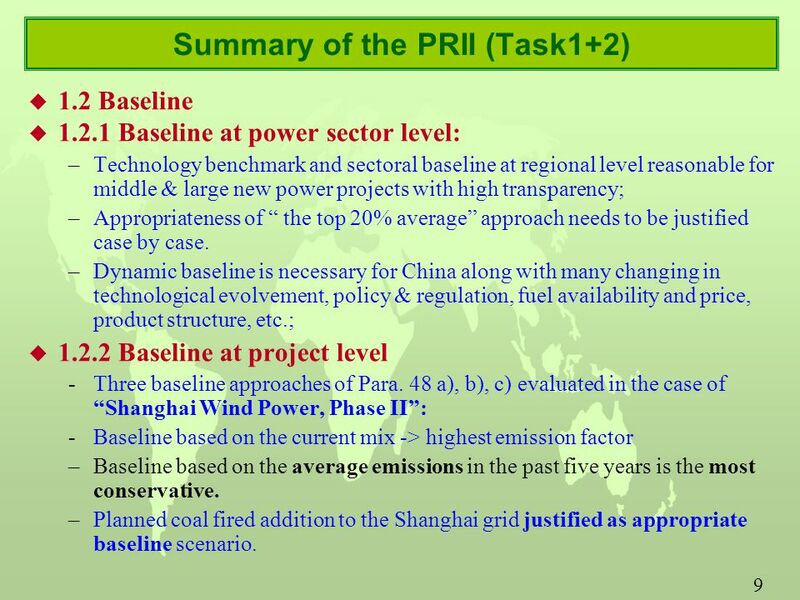 9 9 Summary of the PRII (Task1+2) u 1.2 Baseline u 1.2.1 Baseline at power sector level: –Technology benchmark and sectoral baseline at regional level reasonable for middle & large new power projects with high transparency; –Appropriateness of “ the top 20% average” approach needs to be justified case by case. –Dynamic baseline is necessary for China along with many changing in technological evolvement, policy & regulation, fuel availability and price, product structure, etc. ; u 1.2.2 Baseline at project level -Three baseline approaches of Para. 48 a), b), c) evaluated in the case of “Shanghai Wind Power, Phase II”: -Baseline based on the current mix -> highest emission factor –Baseline based on the average emissions in the past five years is the most conservative. –Planned coal fired addition to the Shanghai grid justified as appropriate baseline scenario. 10 10 Summary of the PRII (Task2) u 1.2.3. For the new built fossil fuel power project u Case: Huaneng-Qinbei Supercritical Coal Fired Power Project: u Scenario1: Existing provincial grid mix, constant emission factor/kWh –Assuming not likely to build new coal fired power plants, while remaining existing grid capacity & mix without change up to 2020, is thus not very accurate. Baseline: 1.15 kg CO 2 /kWhe, ex ante. u Scenario 2: Recent additions only - built margin average emissions, 48c): –Very reasonable that the CDM project will most likely to replace or delay new coal fired power capacity otherwise in baseline case. –The capacity mix of the recent additions would not change significantly in the near future, so that the ex ante built margin grid mix is used. –Hydropower is “base load”, and thus rejected from into baseline. –By “top 20% average in past 5 years”, Baseline: 1.03 kg-CO 2 /kWhe. u Scenario 3: Combination of Existing Power Grid and Future Additions: –Combination of Scenario 1 with 2 but with ex post added up to 2015. –Due to less data availability, a trade-off is the combination of existing generation mix and Phase I of Qinbei. 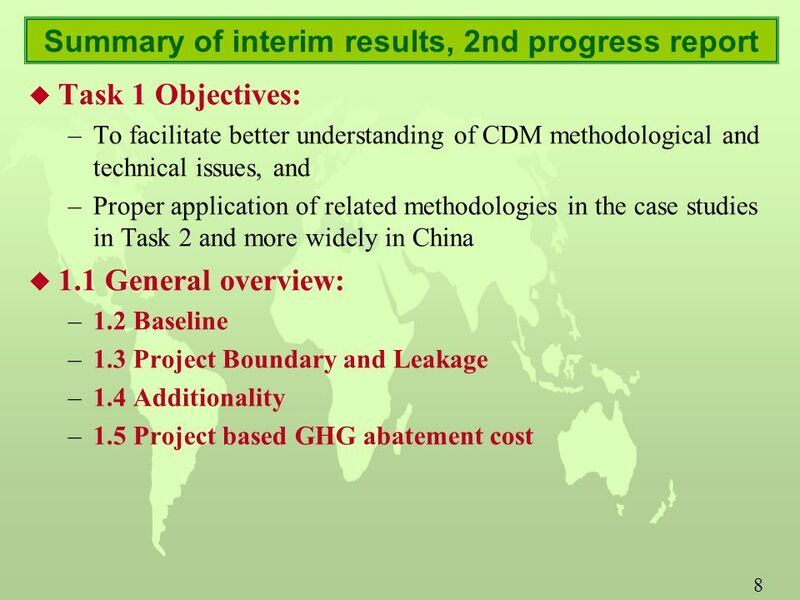 Baseline: 1.13 kg CO 2 /kWhe u Conclusion: Scenario 2 baseline methodology is justified as the most appropriate and conservative for Qinbei Supercritical Project. 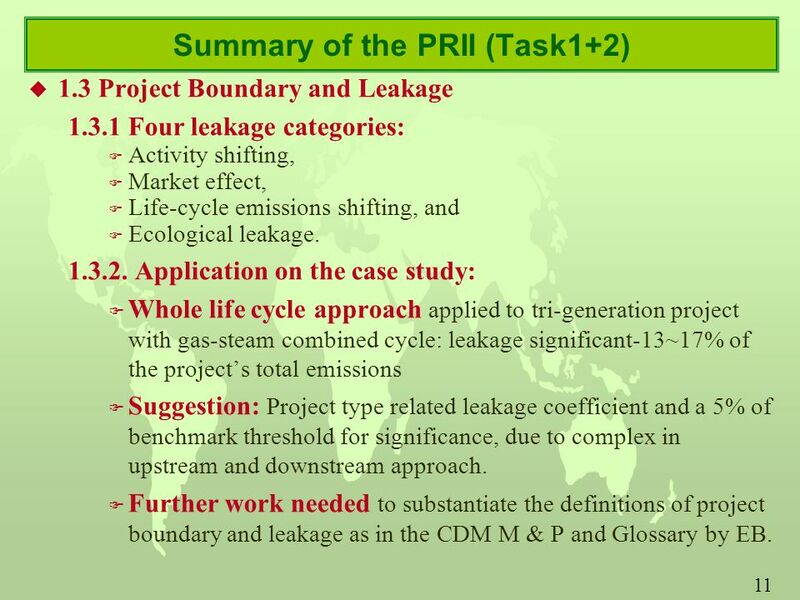 11 11 Summary of the PRII (Task1+2) u 1.3 Project Boundary and Leakage 1.3.1 Four leakage categories: F Activity shifting, F Market effect, F Life-cycle emissions shifting, and F Ecological leakage. 1.3.2. 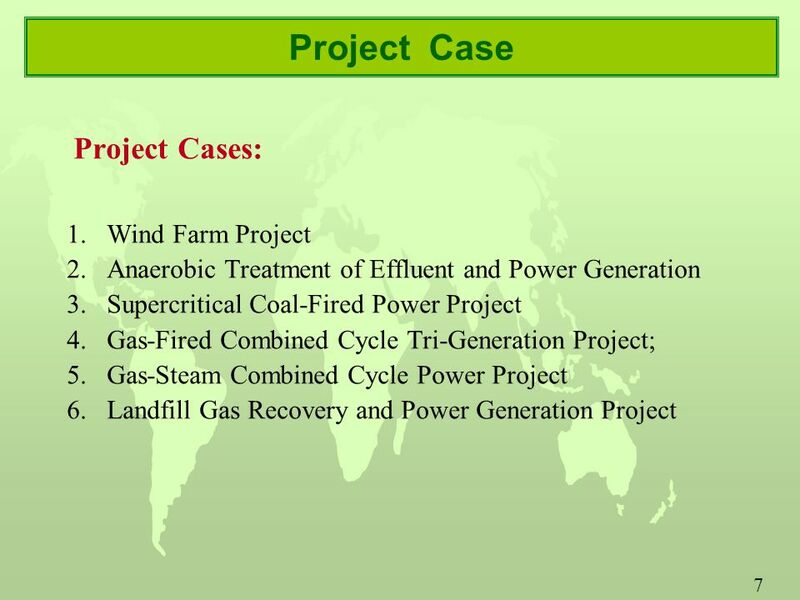 Application on the case study: F Whole life cycle approach applied to tri-generation project with gas-steam combined cycle: leakage significant-13~17% of the project’s total emissions F Suggestion: Project type related leakage coefficient and a 5% of benchmark threshold for significance, due to complex in upstream and downstream approach. F Further work needed to substantiate the definitions of project boundary and leakage as in the CDM M & P and Glossary by EB. 12 12 Summary of the PRII (Task1+2) u 1.4 Additionality 1.4.1. Principles considered: F Easy operation; F Reflection of real situation; F Rational data required; F Limited system error; F Low uncertainty; F Low cost; and objective. 1.4.2. 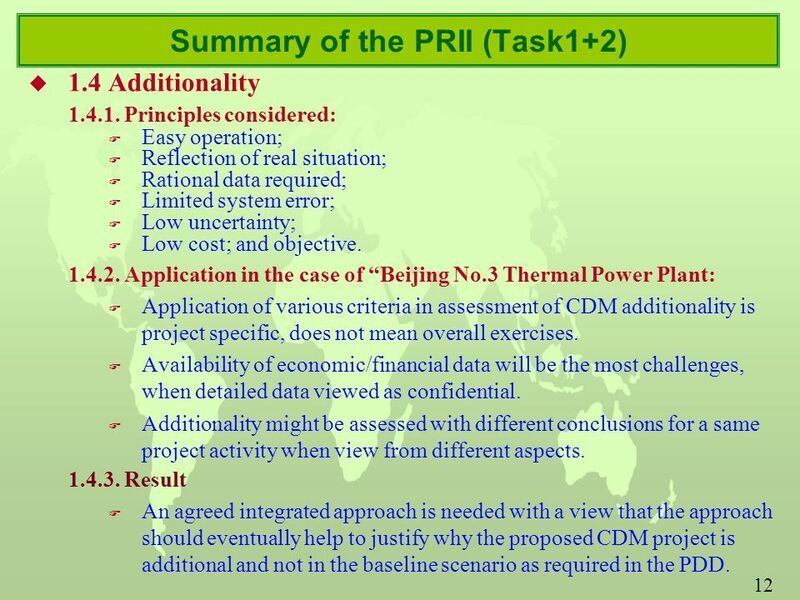 Application in the case of “Beijing No.3 Thermal Power Plant: F Application of various criteria in assessment of CDM additionality is project specific, does not mean overall exercises. F Availability of economic/financial data will be the most challenges, when detailed data viewed as confidential. F Additionality might be assessed with different conclusions for a same project activity when view from different aspects. 1.4.3. Result F An agreed integrated approach is needed with a view that the approach should eventually help to justify why the proposed CDM project is additional and not in the baseline scenario as required in the PDD. 13 13 Summary of the PRII (Task2) u 1.2.2. For the new built fossil fuel power project u Case: Huaneng-Qinbei Supercritical Coal Fired Power Project: u Scenario1: Existing provincial grid mix, constant emission factor/kWh –Assuming not likely to build new coal fired power plants, while remaining existing grid capacity & mix without change up to 2020, is thus not very accurate. Baseline: 1.15 kg CO 2 /kWhe, ex ante. u Scenario 2: Recent additions only - built margin average emissions, 48c): –Very reasonable that the CDM project will most likely to replace or delay new coal fired power capacity otherwise in baseline case. –The capacity mix of the recent additions would not change significantly in the near future, so that the ex ante built margin grid mix is used. –Hydropower is “base load”, and thus rejected from into baseline. –By “top 20% average in past 5 years”, Baseline: 1.03 kg-CO 2 /kWhe. u Scenario 3: Combination of Existing Power Grid and Future Additions: –Combination of Scenario 1 with 2 but with ex post added up to 2015. –Due to less data availability, a trade-off is the combination of existing generation mix and Phase I of Qinbei. 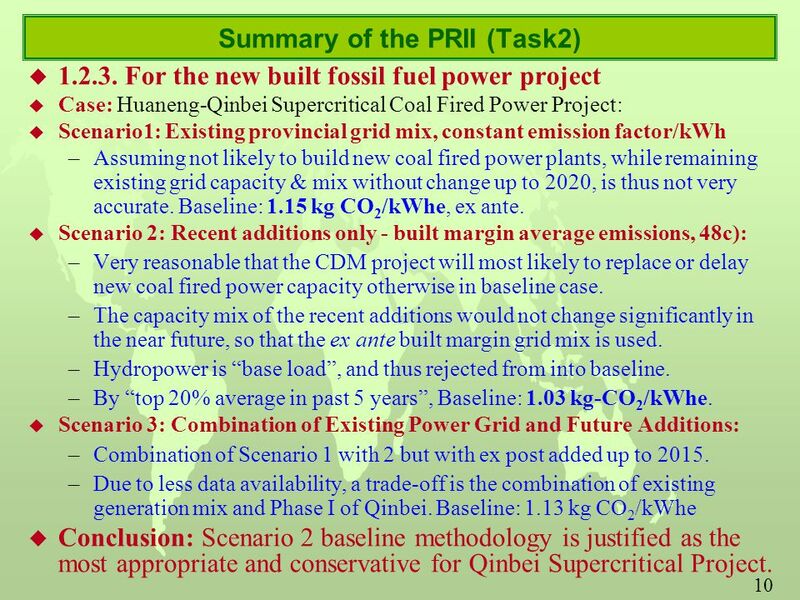 Baseline: 1.13 kg CO 2 /kWhe u Conclusion: Scenario 2 baseline methodology is justified as the most appropriate and conservative for Qinbei Supercritical Project. 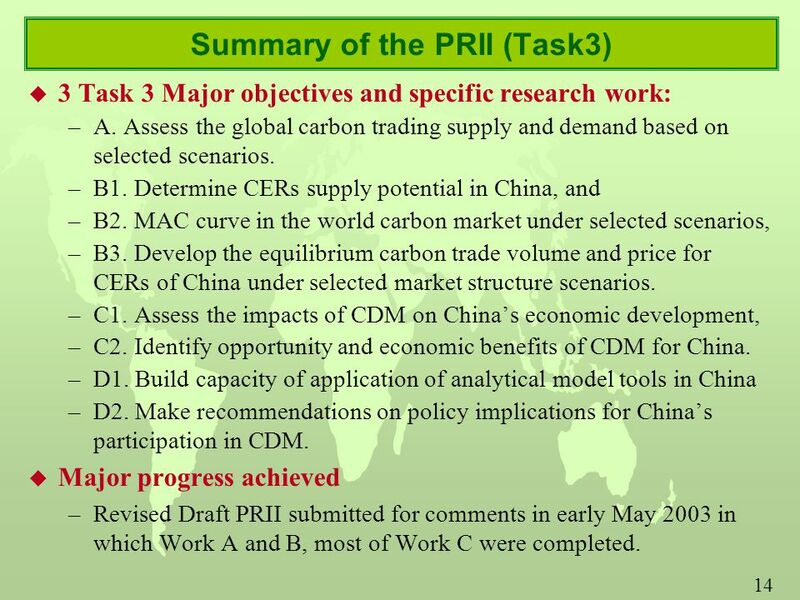 14 14 Summary of the PRII (Task3) u 3 Task 3 Major objectives and specific research work: –A. Assess the global carbon trading supply and demand based on selected scenarios. –B1. Determine CERs supply potential in China, and –B2. MAC curve in the world carbon market under selected scenarios, –B3. Develop the equilibrium carbon trade volume and price for CERs of China under selected market structure scenarios. –C1. 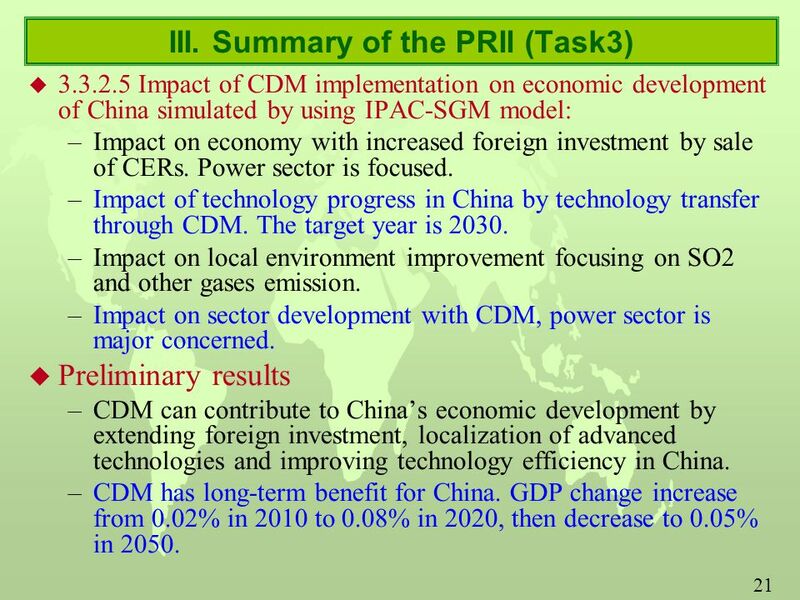 Assess the impacts of CDM on China’s economic development, –C2. 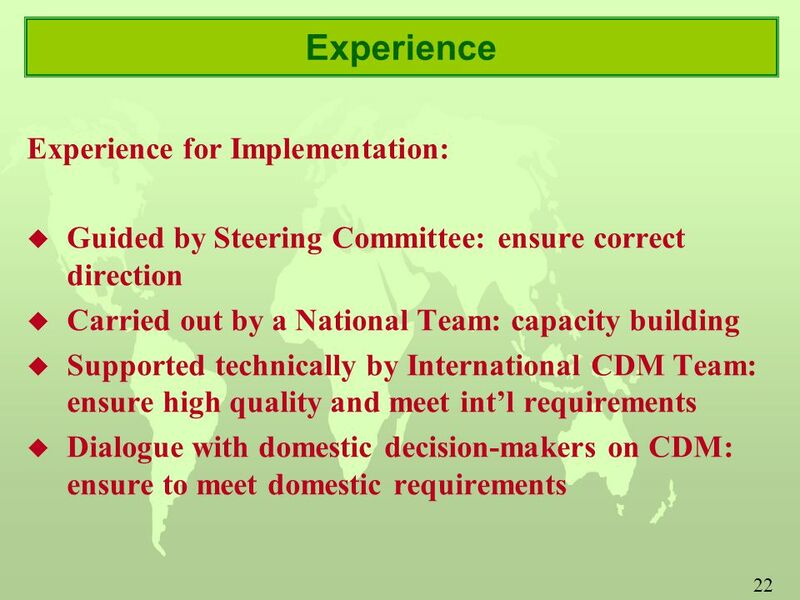 Identify opportunity and economic benefits of CDM for China. –D1. 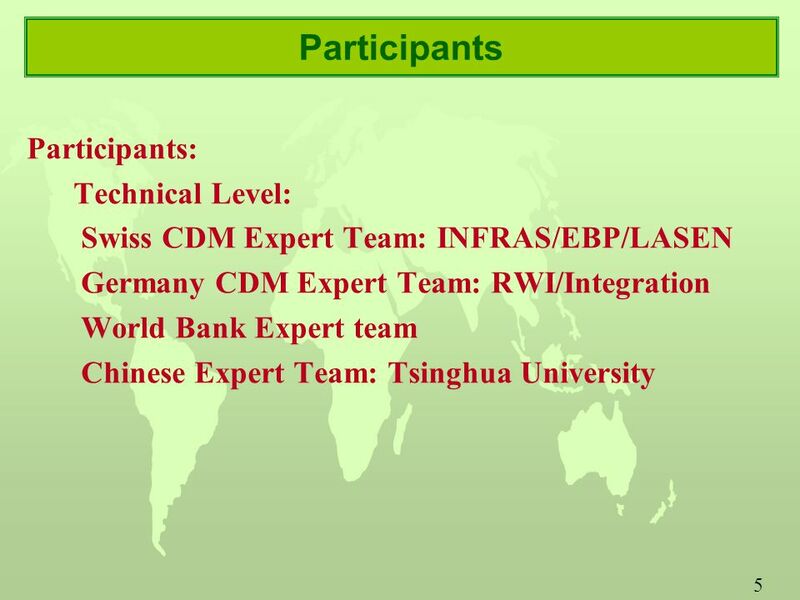 Build capacity of application of analytical model tools in China –D2. 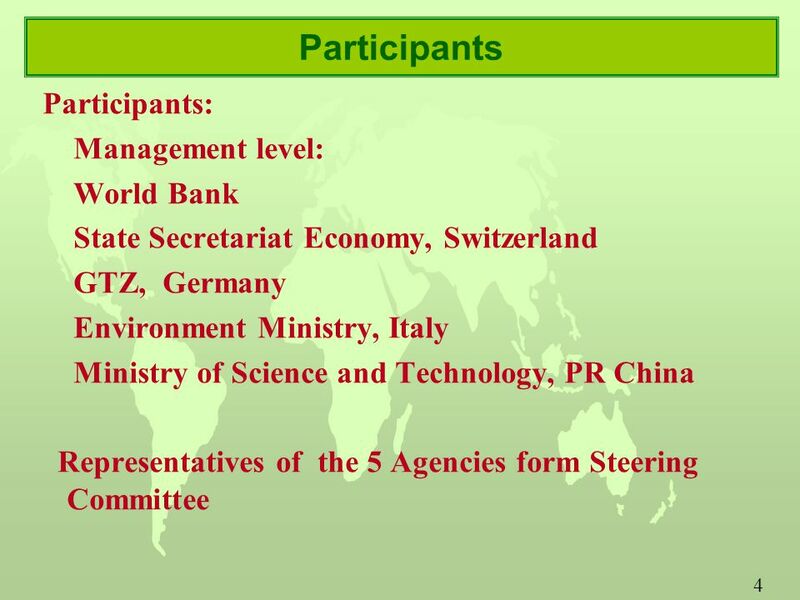 Make recommendations on policy implications for China’s participation in CDM. 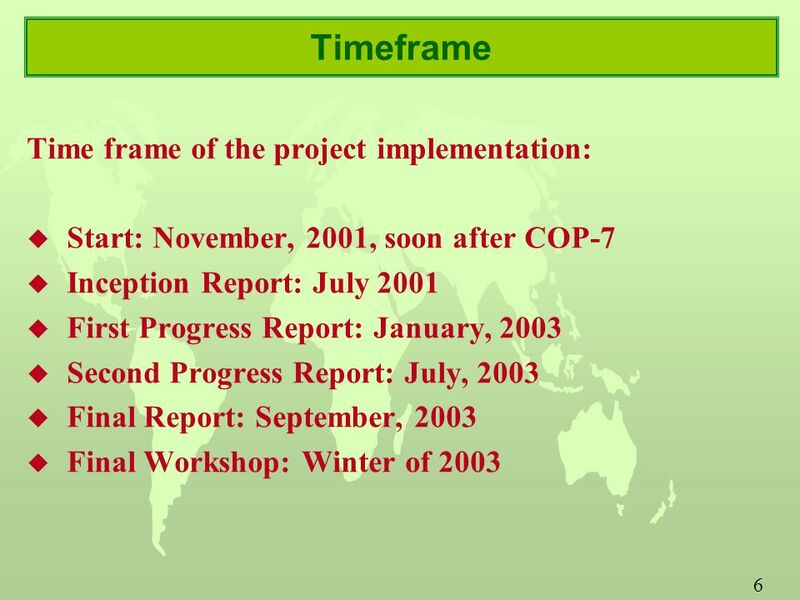 u Major progress achieved –Revised Draft PRII submitted for comments in early May 2003 in which Work A and B, most of Work C were completed. 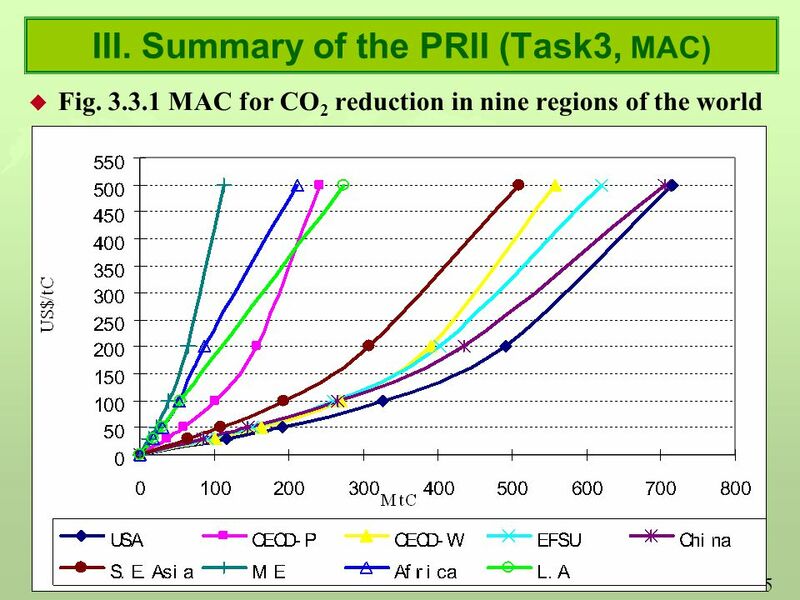 16 16 Summary of the PRII (Task3) (MAC) u Preliminary conclusions on MAC: u China and USA have lowest cost in absolute reduction amount and large emission reduction potential. u Middle East, Africa and Latin America have highest cost and relatively small potential for CO 2 emission reduction. 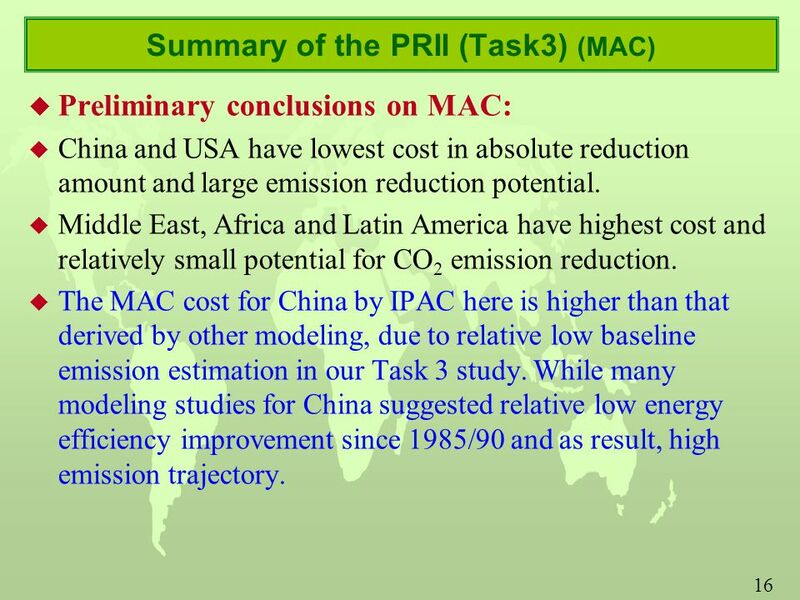 u The MAC cost for China by IPAC here is higher than that derived by other modeling, due to relative low baseline emission estimation in our Task 3 study. While many modeling studies for China suggested relative low energy efficiency improvement since 1985/90 and as result, high emission trajectory. 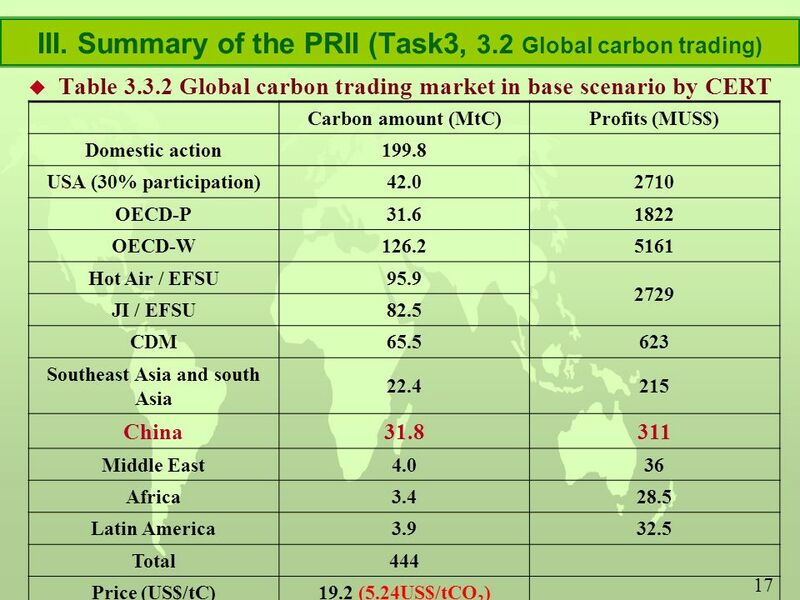 18 18 Summary of the PRII (Task3) (carbon trading) Market Structure Price (US$/tC, at 2000 price) Global CDM Potentials (MtC) China CDM Potentials (MtC) China's profits (M US$, at 2000 price) EFSU price leadership19.265.531.8310.8 Perfect competition4.210.05.15.4 Monopoly16.00.0 -- Table 3.3.3 Carbon trading simulation under different market structure Global carbon trading market analyzed by CERT. CERT model incorporates a variety of switches, such as − Implementation rate,  Transaction cost, − Supplementary,  Participation rate of USA, − Market structure, etc. to allow analyzing their impacts on the market. 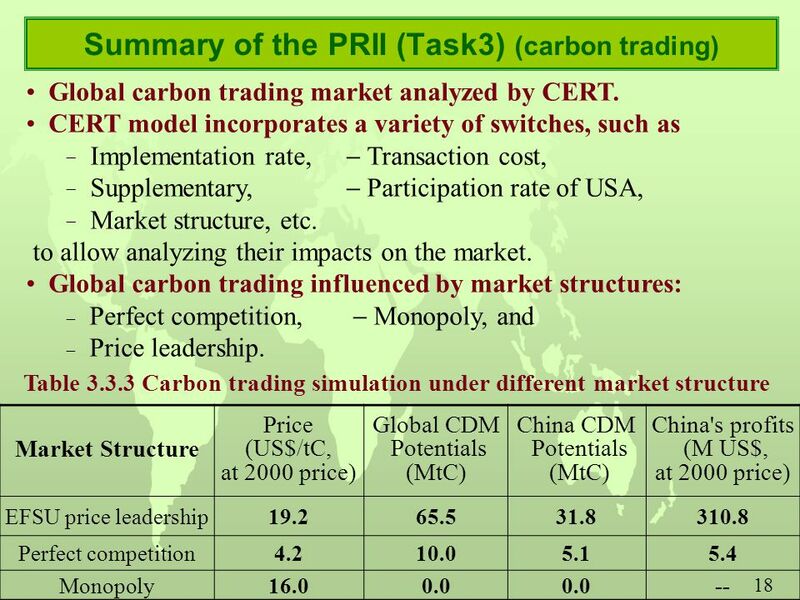 Global carbon trading influenced by market structures:  Perfect competition,  Monopoly, and  Price leadership. 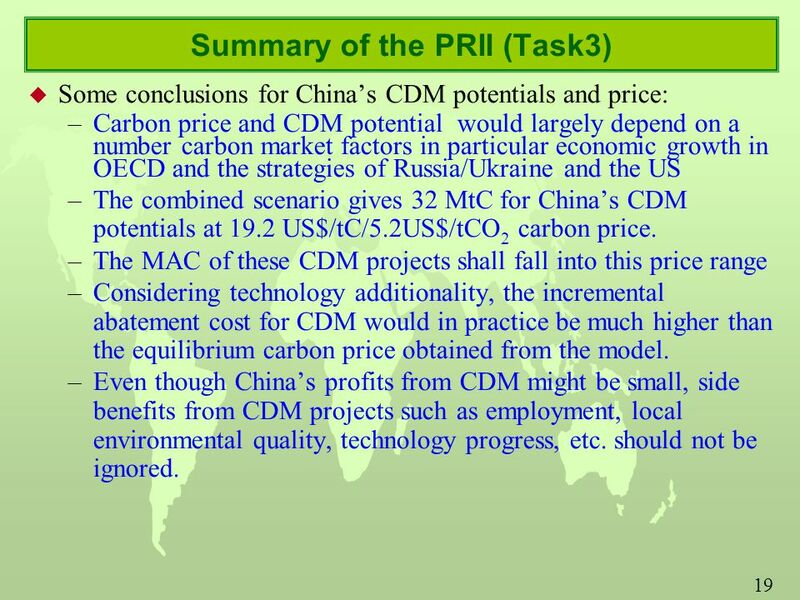 19 19 Summary of the PRII (Task3) u Some conclusions for China’s CDM potentials and price: –Carbon price and CDM potential would largely depend on a number carbon market factors in particular economic growth in OECD and the strategies of Russia/Ukraine and the US –The combined scenario gives 32 MtC for China’s CDM potentials at 19.2 US$/tC/5.2US$/tCO 2 carbon price. –The MAC of these CDM projects shall fall into this price range –Considering technology additionality, the incremental abatement cost for CDM would in practice be much higher than the equilibrium carbon price obtained from the model. –Even though China’s profits from CDM might be small, side benefits from CDM projects such as employment, local environmental quality, technology progress, etc. should not be ignored. 21 21 III. 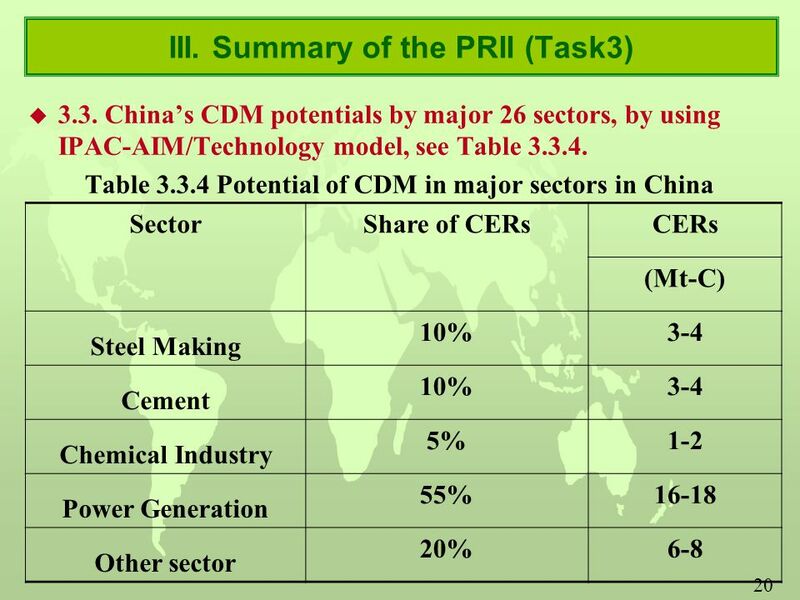 Summary of the PRII (Task3) u 3.3.2.5 Impact of CDM implementation on economic development of China simulated by using IPAC-SGM model: –Impact on economy with increased foreign investment by sale of CERs. Power sector is focused. –Impact of technology progress in China by technology transfer through CDM. The target year is 2030. –Impact on local environment improvement focusing on SO2 and other gases emission. –Impact on sector development with CDM, power sector is major concerned. u Preliminary results –CDM can contribute to China’s economic development by extending foreign investment, localization of advanced technologies and improving technology efficiency in China. –CDM has long-term benefit for China. GDP change increase from 0.02% in 2010 to 0.08% in 2020, then decrease to 0.05% in 2050. 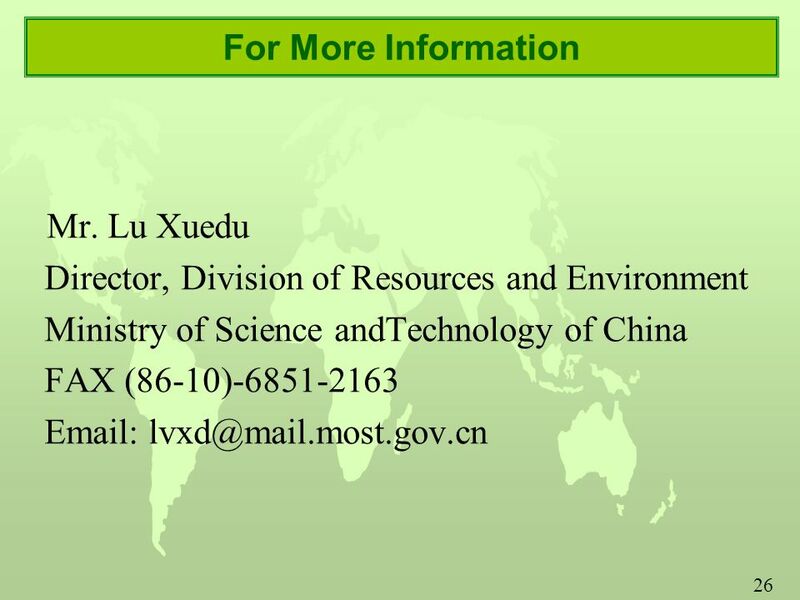 Download ppt "1 The NSS Side Event AT SBSTA 18 Report of Study on the Methodologies and Its Application of Clean Development Mechanism in China Lu Xuedu Ministry of." UNFCCC secretariat, Sustainable Development Mechanisms Verónica Colerio, Standard Setting Unit Standardized Baselines in the CDM: Decisions and Way Forward. COP-8 Side Event - Thursday 31 October Development & Climate Change: Issues & Opportunities in Asia IPIECA Workshop - Key Messages and Learning's Kuala. 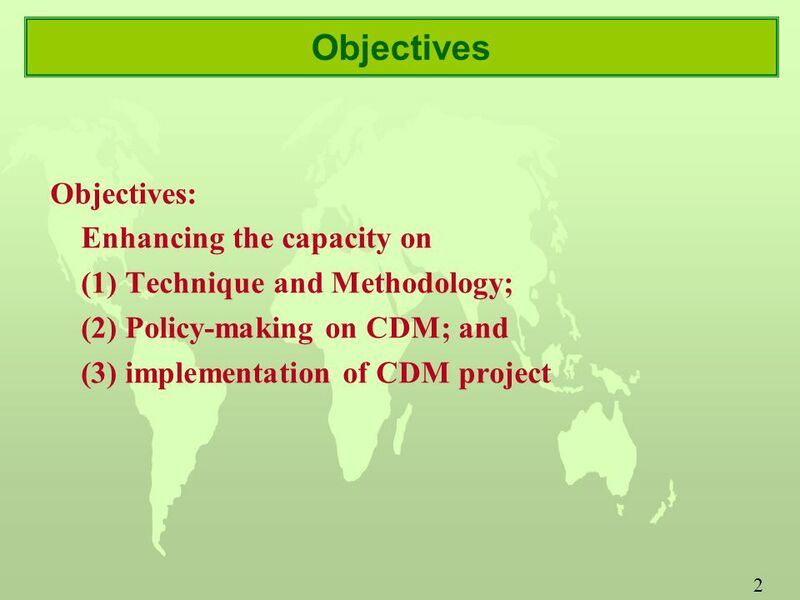 Structure of DNA and Proposed Sustainable Development Criteria for CDM Projects In Bangladesh CDM Designated National Authority (DNA) Durbar Conference. Yuji MIZUNO Institute for Global Environmental Strategies Baseline for Waste Management Project Regional Workshop in Asia on Capacity Development for the. 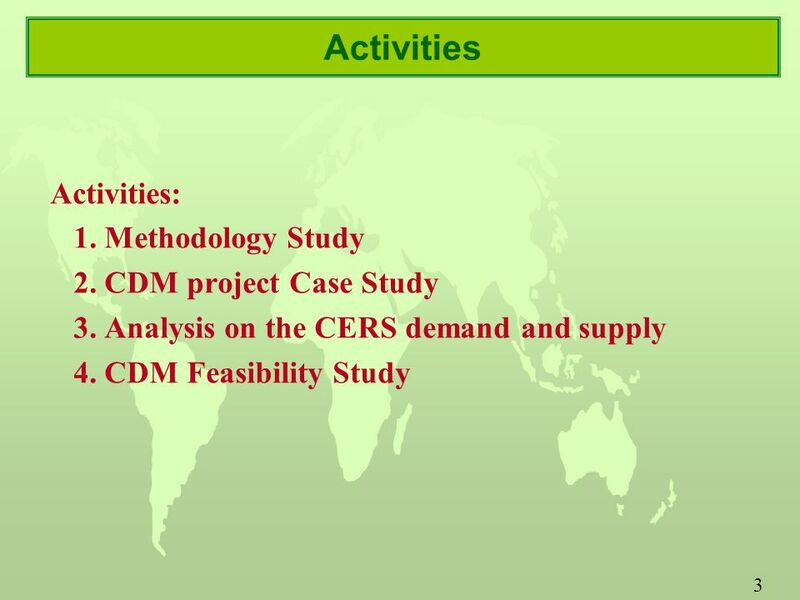 ww.neprisoe.org CDM Methodologies Carbon Markets – CDM project development 8. August 2011 Jørgen Fenhann. International Climate Policy Hamburg Institute of International Economics International Climate Policy Graduation and deepening: a suggestion to move international. 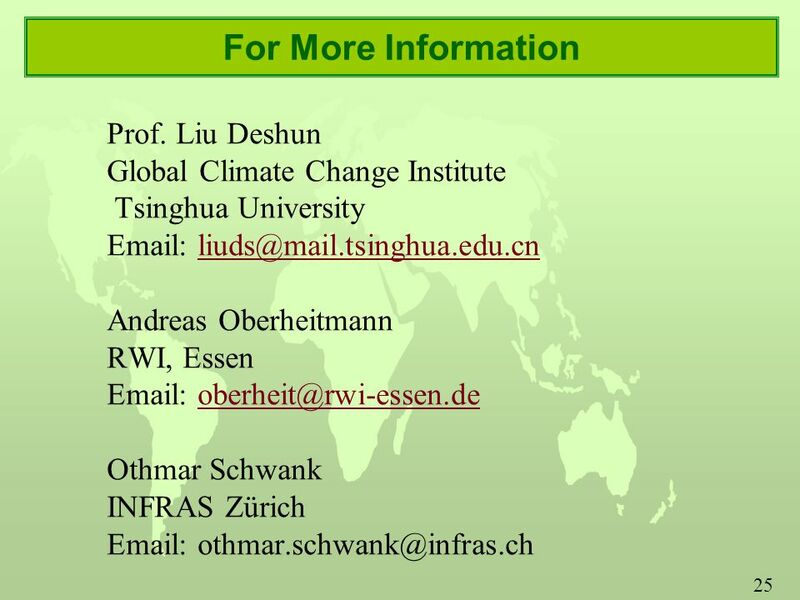 Towards a Low Carbon Future: China’s Green Development Policy and Practice Ye QI Climate and Carbon Policy Institute (CPI) Tsinghua University & China. 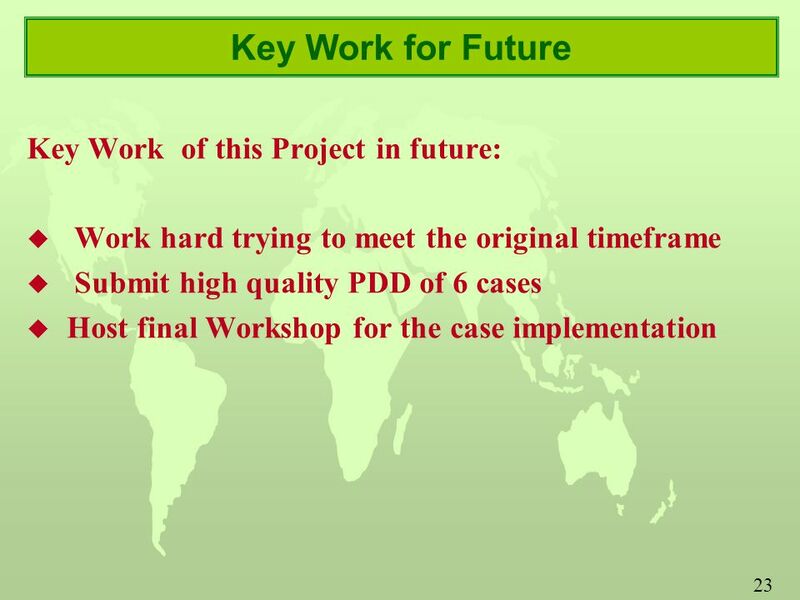 Implementation of Capacity Development for CDM Project in Viet Nam Nguyen Khac Hieu Climate Change Coordinator Vietnam National Office for Climate Change. 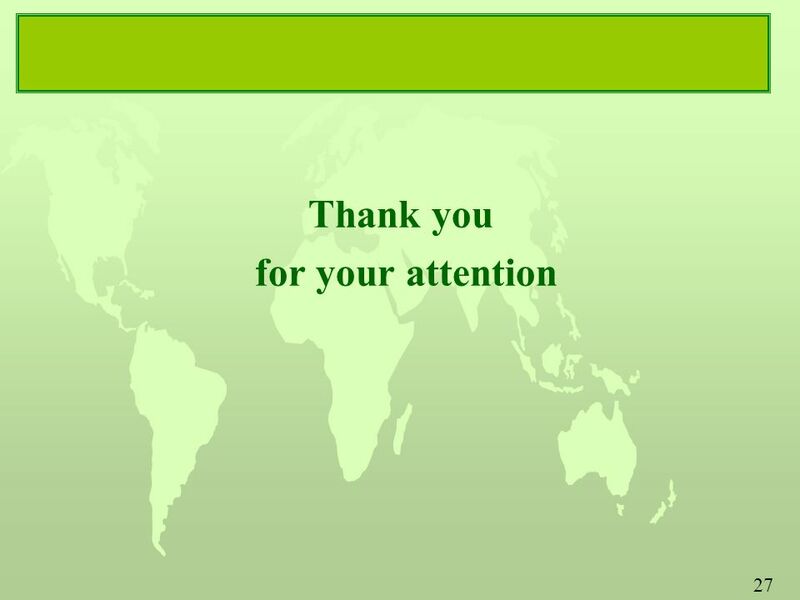 MITIGATION POTENTIAL AND EMISSION REDUCTION CONFIDENTIAL 1. Copenhagen 29 June Energy and climate outlook: Renewables in a world and European perspective Peter Russ. 1 Kyoto Mechanism and Technology Transfer April 9-10, 2003 UNFCCC WS on Technology Transfer Shigetaka SEKI Director for Environmental Affairs Ministry. María Paz Cigarán National Environmental Council (CONAM) June 12, 2003 NATIONAL STRATEGY STUDY Clean Development Mechanism - NSS PERU. An Introduction to the Role of Carbon Capture and Storage in Ukraine Keith Whiriskey. Trans-Boundary Cooperation in the South Asia Power Sector: Opportunities and Challenges Mike Toman Manager, Environment and Energy Team Development Research. TÜV SÜD Group Carbon Management Service Methodology and Project Development – Notions of a DOE Methodology and Project Development – Notions of a DOE PCF.